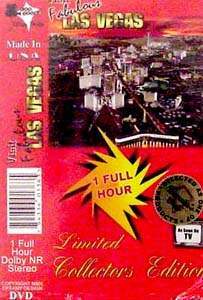 DVD - See the grandeur of the Las Vegas Strip, the Fremont Experience, pirate ships, volcanoes, Old Nevada, slots and a view of the surrounding area. Updated each year, Fabulous Las Vegas has sold over a million videos. Also available in VHS. FREE shipping within the United States. Regular retail price is $29.95.